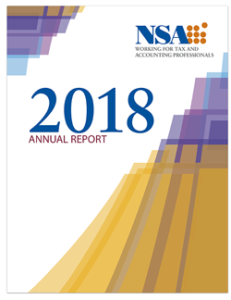 The NSA has just released a brand new annual report for 2018. It recaps last year, but carries a broader message: NSA is changing for the benefit of its members. “…I am working closely with NSA’s CEO John Rice and our Board of Governors to re-energize NSA. We have created a new Strategic Plan to chart NSA’s course forward. As part of that new plan, we sent out an education survey to you this year and learned quite a bit about your preferences for live events which will inform our decisions regarding educational programs for this year and beyond. Download a copy and read more about the future of the National Society of Accountants.